Lough Ree Lifeboat searching for missing Armagh angler Daryl Burke. A car was burnt out during sporadic violence involving youths in the Dunmurry area overnight. Police dealt with sporadic disorder in the Pembrook Loop Road and Bell Steele Road areas of Dunmurry overnight and into the early hours of today (March 18). Police came under attack from the youths and a number of arrests were made. Area Commander Chief Inspector John Wilson said: “At various times throughout the late evening and early hours of this morning we received reports of large numbers of youths gathering in the area. 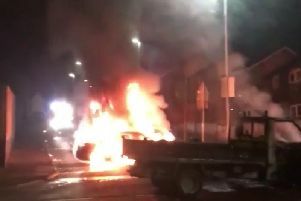 “Residents reported young people drinking and causing a disturbance close to the shops and a car was also set on fire in the Sally Gardens area. Chief Insp Wilson appealed to parents to know where their children are and asked them to speak to them about the dangers of consuming alcohol.